GPU Core Power and Chip Power bug? 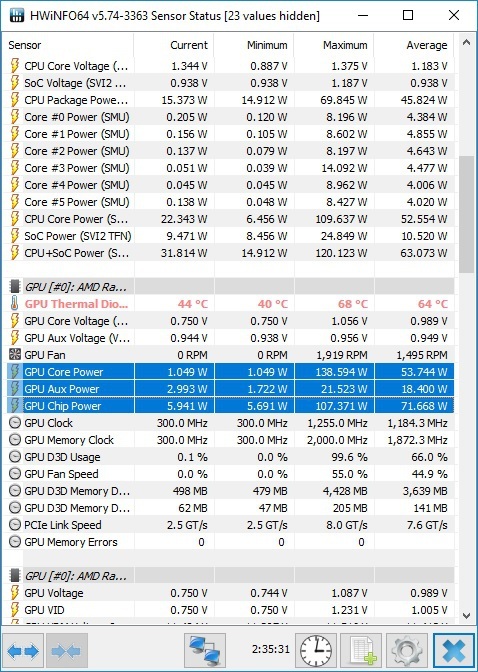 I think there may be a issue for the GPU reading. According to a previous thread, GPU Chip Power consists of GPU Core Power. But for my case, the maximum GPU chip power is less than my GPU core power, then the maths don't add up. The average of GPU chip power is also more than GPU core power, which makes this more confusing. Am I missing out in something? Which one should I be looking at? Since the GPU can switch power states (voltage/power levels) very quick there can be very short peaks measured. This is what appears are GPU Core or Aux power that read the instant values, while the GPU chip power performs certain averaging over short time intervals. So you should not rely on the min/max values, rather average ones, which provide more accurate data. Also The GPU Chip Power should be considered as the more reliable readout. (03-27-2018, 09:48 AM)Martin Wrote: Since the GPU can switch power states (voltage/power levels) very quick there can be very short peaks measured. This is what appears are GPU Core or Aux power that read the instant values, while the GPU chip power performs certain averaging over short time intervals. So you should not rely on the min/max values, rather average ones, which provide more accurate data. Also The GPU Chip Power should be considered as the more reliable readout. Current time: 04-25-2019, 09:18 PM Powered By MyBB, © 2002-2019 MyBB Group.